HELP! is a safety guide through the jungle of Beatles LP-publications and editions. On nearly 1000 pages any edition from Germany, Switzerland and Austria is listed and described in details. Read more about the book. 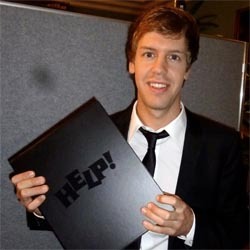 Sebastian Vettel loves very fast cars and the music of the Beatles! The Formula I Champion is proud owner of our discography HELP and from now on he can study everything about Beatles-LP-publications in Germany, Austria and Suisse on nearly 1000 pages. Have a good time and enjoy reading. Good luck to you!